The following article appeared in El Pais on 1st August 2014. It has been translated for vamosbrigade.com by nou.amic. An Indiba machine to regenerate tissue, alleviate the pain and accelerate the healing of the injury to his right wrist with high-frequency radio waves. Electro stimulation so as not to lose muscle tone. Anti-inflammatories. A splint protecting his wrist. The world number two, Rafa Nadal, is using all this to be able to make it in time to participate in the United States Open (from 25th August) after injury forced him to pull out of the Masters 1000 in Toronto (next week) and Cincinnati (from 10th August), where he was defending both titles, and 2000 valuable ranking points. 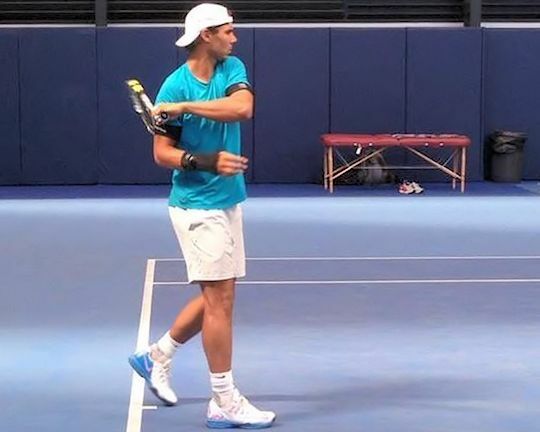 While he continues with light practice in Manacor - the injury does not bother him when serving and only impedes him hitting his two-handed backhand, the 14-time Grand Slam champion is trying to up his chances of travelling to New York. Next week he will be flying back to Barcelona, where the doctors Ángel Ruiz Cotorro, Jaume Vilaró and Ramón Balius will study a new musculotendinous ultrasound scan and determine if they will maintain the conservative treatment they have adopted - the splint to immobilize the wrist - or if they will change to mesotherapy - micro-injections to ease the pain the tennis player is suffering as a result of "a small detachment of the sheath of the extensor carpi ulnaris tendon in his right wrist". 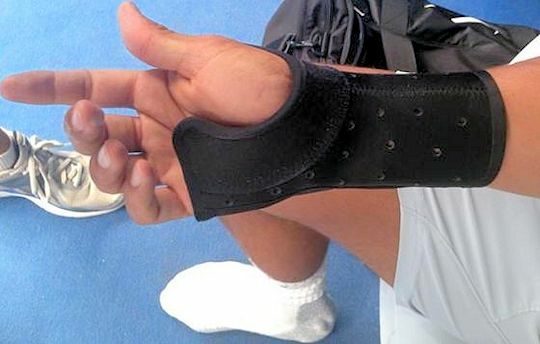 "Unlike the tendinopathies he has suffered, which are more the product of overloading and effort, this is a clean injury, the result of bad luck, an accident caused by hitting his backhand in a strange position," Dr Cotorro, the tennis player's and the Spanish Federation doctor from the Mapfre Clinic in Barcelona, where Nadal is treated, said by telephone: "The two things don't have anything to do with one another. This was an odd movement, and, just like a sprain, if it heals well then it shouldn't be of any importance." Nobody takes it as certain that the Spaniard will be present at the final Grand Slam tournament of the year, where he is defending the title won in 2013 against Djokovic. As he is 28, and has always been a tennis player who needs to find rhythm, the prolonged stoppage - he has not played since 1st July when he lost in the R16 at Wimbledon to Nick Kyrgios - opens up the unknown factor of just how difficult it will be for him to return to competition on a surface that is not his favourite - cement - with the maximum demands being made of him - just after the US Open, Davis Cup captain Carlos Moya would like to count on him for the visit to Brazil for the World Group play-off tie. Meanwhile, in Manacor, always accompanied by Toni Nadal, his uncle and coach, Nadal practises drive after drive: objective, New York.